Our drought response studies have been downloaded more than 10,000 times since their release in June. Our work has been featured in over 1,400 online and print media stories since the beginning of the year. We’ve met with Governor Jerry Brown, former Governor Arnold Schwarzenegger,the California Water Commission, the State Water Resources Control Board, and other leaders. We are happy to report that our leaders are listening to our recommendations and taking action. 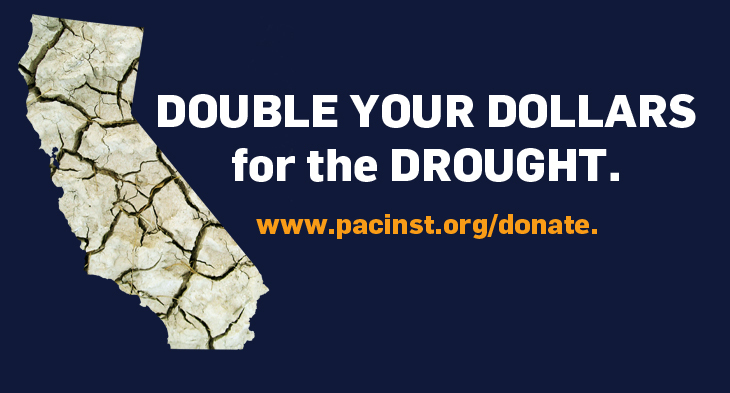 Your donation today will boost the Pacific Institute’s timely drought-focused work, including widely disseminating a nuanced analysis of Proposition 1. With your support, we will inform California voters about the water bond measure before they go to the polls on November 4. 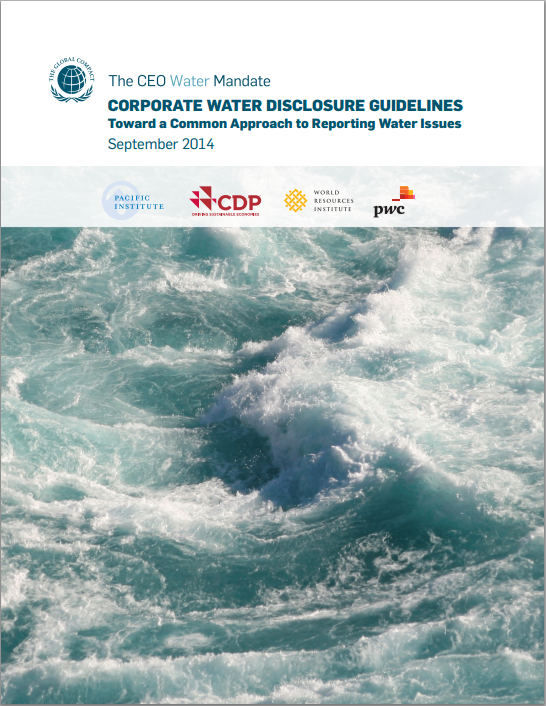 A recent report released by the CEO Water mandate-in collaboration with CDP, Global Reporting Initiative, PricewaterhouseCoopers, and World Resources Institute-launches a common sense approach for corporate water use disclosures. This highly collaborative effort used many years of water assessment and disclosure metrics and tools to build, a framework for the most meaningful and effective ways of disclosing corporate water management practices. In an accompanying terminology guide, the key terms “water scarcity”, “water stress”, and “water risk” are defined and incorporated into the guidelines-all ensuring the guidance is accessible and feasible for companies, while remaining meaningful for their stakeholders. Read more. 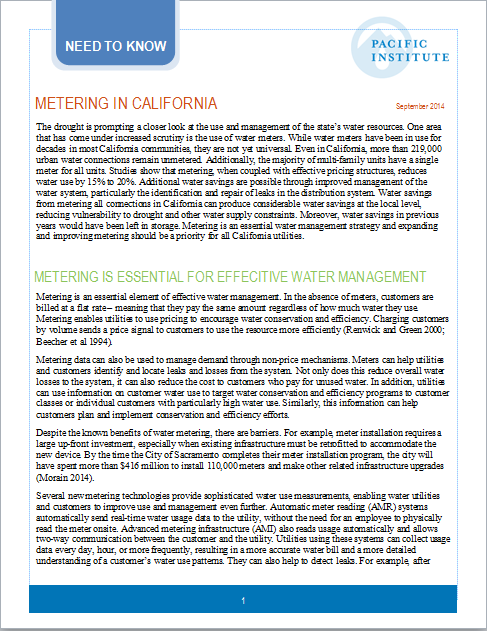 The Pacific Institute’s latest factsheet, Metering in California describes the necessity of water meters and the benefits they may have on California water conservation. According to the factsheet, metering and charging customers based on those meters, may reduce water use by 15% to 20%. They may also find leaks and inefficacies-conserving even more water. Despite these benefits, more than 219,000 urban water connects in California remain unmetered. During this period of drought, utilities and customers stand to gain from expanding and improving water metering. Read more. In the most recent update, our team reports on water shortages, wildfires, and groundwater legislation. 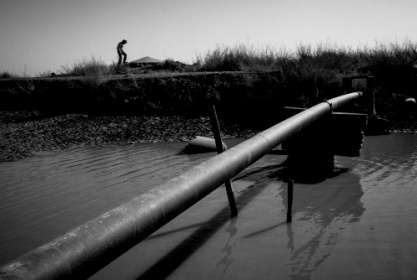 Nearly 1000 groundwater-reliant homes are now facing water shortages. Read the latest drought update. 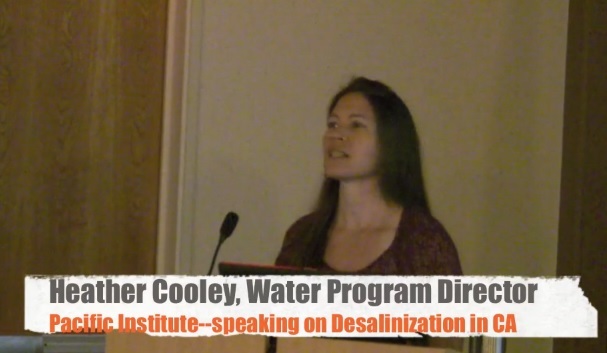 On September 22nd, Heather Cooley spoke at a brown bag seminar with the Delta Stewardship Council in Sacramento on the positive and negative consequences of desalination. She focused on the increasing interest in desalination and the key issues of water supply, availability, and reliability in terms of expanding desalination facilities along the California coast. On September 24th,Ms. Cooley also testified before the state Assembly Select Committee on Coastal Protection regarding the impacts of desalination. Her two testimonies focused on water intakes and overarching policy issues. The California drought is becoming a test of modern American democracy’s capacity to recognizechange and to adjust — perhaps dramatically – to a region’s water-rich economy and way of life to an unfolding era of scarce moisture. California Governor Jerry Brown understands the threat. Through actions large and small, he is marshaling personnel and resources both to act now and prepare for the future. This week, Circle of Blue reports on how the governor has responded to the slow-motion calamity, including a 2013-2014 timeline. Pacific Institute staff presented talks and workshops this month, among them presenting the Institute’s research on hydraulic fracturing in California, water conflict and security, and the key issues with desalination for California. Read the full list and more details here. “Water Fights: California Water Bond” at the Brower Center in Berkeley, California on Thursday, October 23. Event beings at 7:00 pm and is free to the public (suggested donation of $10). For more information and to RSVP, click here. “Chasing Water,” a session on the future of water at home and abroad at the Northern California Commonwealth Club Chapter. Learn more here. On Monday October 20th, Peter Gleick will speak at a U.S. Water Policy forum. The Stanford Woods Institute for the Environment in partnership with The Hamilton Project at Brookings will host this event highlighting opportunities for improving water management in the United States in the face of scarce water supplies. To register and for additional information, please see click here. Pacific Institute Corporate Sustainability Program Director Jason Morrison will participate in the session, “Water Technology Solutions: The Good, the Bad and the Ugly,” at the GreenBiz Group’s flagship VERGE San Francisco conference on October 27 – 30. The conference will bring together the world’s largest companies, most progressive cities, brightest thought leaders and technology innovators to explore how technology accelerates sustainability solutions across industries and sectors. Learn more here. San Francisco Chronicle: Peter Gleick shares his thoughts on the upcoming water bond. National Geographic: With decreasing snowpack, groundwater becomes more in demand. Peter Gleick provides a statement regarding unsustainable groundwater use. Associated Press: Peter Gleick speaks about water metering in California during the drought. Los Angeles Times: the Pacific Institute’s Senior Research Associate Michael Cohen is quoted on the magnitude of the costs associated with the Salton Sea.